One of Timişoara’s main sights is fabric district. It can be reached via the Bega Bridge. The Millennium church was consecrated in 1901 for the millennial anniversary of the Kingdom of Hungary. It was built by Miklós Ybl and its organ, which still functions today, came from the workshop of Leopold Wegenstein. On the way to the church, one passes the Neptune bath, one of many buildings by architect László Székely. Close to the park and the Apollo cinema, one of the city’s most beautiful synagogues can be found. Unfortunately, the building which was designed by Leopold Baumhorn in Moorish style, is dilapidated and can only be seen from outside. Romania’s oldest brewery, “Timişoreana“ was founded in 1718. Today, it is part of the South African company SAB-Miller. The refurbished beer hall can be visited. 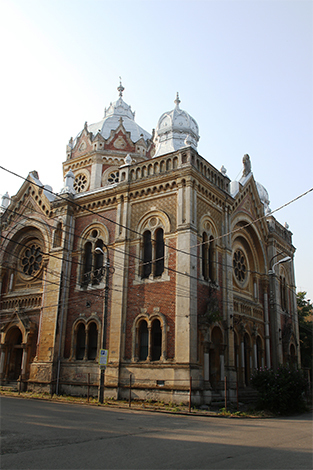 The synagogue in fabric district can unfortunately not be visited anymore due to dilapidation.